If you thought living on peanut butter and jelly sandwiches could get you through the recession, think again. The sandwich spread is seeing a major price hike. Thanks to a failing peanut crop due to last summer's scorching hot weather, there's a shortage of peanuts in supply. Big brands like Peter Pan, Jif and Smucker's are left with little choice but to raise prices, reports the Wall Street Journal. The price jumps range from 24 to 40 percent, with Jif planning to raise prices by 30 percent in November and Peter Pan by up to 24 percent in the coming weeks, reports MarketWatch Radio. So far, the Wall Street Journal says, USDA figures show the cost of a ton of unprocessed peanuts has spiked from $450 to $1,150 since last year. Researchers at New Mexico State University told ABC KOAT News that high heat, strong winds and bone-dry conditions created the worst peanut season in more than 30 years. 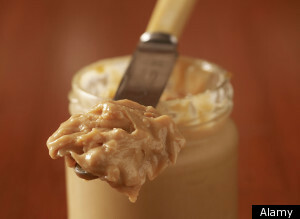 Peanut butter is consumed in 90 percent of U.S. households. Americans consume on average over 1.5 million pounds of peanut butter and peanut products each year, notes to the National Peanut Board. The peanut crop is not the only commodity to suffer from severe weather conditions. French wine and Italian pasta are some other endangered national exports impacted by climate change. Last week, a report claimed chocolate could become a luxury item if farmers in West Africa didn't adapt to the warming climate. Whether you like your peanut butter organic, creamy or nutty, be prepared to pay a hefty price for it. Or stock up before those price hikes kick in.